This property is absolute beachfront in Playa Hermosa with amazing unobstructed views to the ocean, and is one of the only 100% titled beachfront options in the area (most of Costa Rica beachfront is concession). This beautiful property is especially alluring for surfers as it is literally a right in front of one of the best surf spots in the area. For nature lovers it’s a dream, not only is there a turtle refuge down the road, this undeveloped area is teeming with flora and fauna, animal and plant life that make living in Costa Rica so rewarding. The 4132 square foot home (384 meters) features 3 bedrooms, 4 bathrooms, 4 terraces, garage, pool, Jacuzzi, BBQ, private garden, property manager, and has been built to USA and Swiss construction standards (luxury) using Swiss Quality building materials. The lot size is a spacious 5918 sq.foot, (550 meters). Materials used include Egyptian marble, granite, custom stainless steel, high quality ceiling fans, high-efficiency insulated windows and doors (aluminum anodized), locally grown teak wood roofing for outside terraces, ceramic tiled pool, two car garage with electric doors audio throughout, underground electricity, and alarm system connected to guardhouse. This home is situated in a development of only 12 lots of similar size (550 meters). As of March 2015, the lot next to this house is available.There is all infrastructure to the site. There are currently only 7 lots left. For prices on lots and a price for this house and lots, please call me or write. The large beach town of Jaco is located only 10 minutes (drive) to the north, as well as golf and marina (deep sea fishing) at Los Sueños. The capital city of San Jose and international airport is only a one hour 20 minute drive away. Please call me or write to discuss further. Esterillos Este, Esterillos - Custom home builder with model homes to choose from is now offering 4 lots for sale in Esterillos Este area of Central Pacific Costa Rica. These lots are flat, cleared, segregated, titled and ready to build. Electricity and water to the site, road is paved, community of 10 built homes is already established and maintained. Owner of these lots has different floor plans for home on this site to be budgeted at $250,000 including the lot. The award winning beautiful beach and beach club for this community are located one mile away. This quiet, low impact, community has ten completed homes on spacious lots and is a community of Costa Ricans and North Americans, These homes are located in a picturesque country setting in the gently sloping hills of the Esterillos area. This builder designs and completes homes to luxury specifications using the highest standards of construction and an open North American Style floor plan. The rooms are large, with closets, high ceilings, en suite bathrooms, and a beautiful spacious kitchen, dining, den, and living room areas. As well as large patio and backyards, as well as a one or two car garage. The property manager (if needed) lives in this community. The property is located about one mile to area beaches.Beach club has a large pool, restaurant and bar, and other conveniences for your day at the beach. Please call or email me if you’d like to discuss further details regarding this property. I have more pictures, drone videos and floor plans available. • 2,800 sq. ft., 4 bath, 3 bdrm single story - $349,000 - Priced to Excite! Playa Hermosa, Garabito - This is a beautiful “Hacienda Style” property located in the foothills of the Playa Hermosa, Central Pacific area of Costa Rica. This property is a nature lover’s dream with 3.45 acres of lush gentle meadows, views to jungle covered hills and horse country, as well as a spacious and stylish ranch house completed in 2008. This motivated Seller has priced this property perfectly in tune with a Buyer’s market and has kept the property in immaculate condition. Conveniently located only a few miles from one of the most consistent and desired surf breaks in Costa Rica (Playa Hermosa and Playa Jaco), this property is only a few miles from all major amenities and great beaches of the epicenter of the Central Pacific (Playa Jaco), but feels worlds away from the hustle and bustle. This location makes this a rare and treasured find in this growing market area. This property is ideal for a large estate with gardens, beautiful views, fruit trees, flowers, and meadows, as well as containing the potential for additional homes or guest house (land can be divided and resold), retreat center, B and B, multiple residential development, horse property etc. 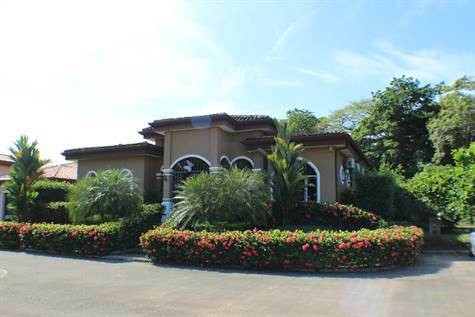 The home on this property is a “Hacienda Style” 3 bedroom/3 bath 2808 sq foot home, built in 2008. There is AC in each bedroom as well as the living room, however, ceiling fans and breezes help keep the house cool as well if you don't want to use AC. The home is extremely well built with steel reinforced concrete block construction and gorgeous vaulted teak ceilings, vigas and frames, and Spanish colonial style iron work and doors. There is no drywall on this property, this house is indestructible! While the kitchen is minimal, the kitchen space is very large, and this space is ready to be customized and completed to create the kitchen of your dreams. The outdoor covered terraces are expansive and wonderful as you’ll find yourself and your guests spending a lot of time outside on the terrace, especially early mornings and at sundown, watching the scenes of nature at work. Scarlet macaws, toucans, Capuchin monkeys, iguanas, blue herons, humming birds, and horses occupy the hedges, fields, hills and skies. Due to the tropical micro-climate, the flora and fauna, fruit trees are flowers in the area are spectacular, abundant and easy to grow year round. There is also a lovely river and waterfall in close proximity to this parcel. There are also four horse stalls on the property, a small caretakers house, electric and wrought iron fencing and slate rock walls enclose the property, there is a land line and internet, hot water throughout, sold fully furnished and in excellent condition. Please call or write today for more information regarding this rare opportunity. Esterillos Este, Esterillos - Welcome to Casa Blanca! 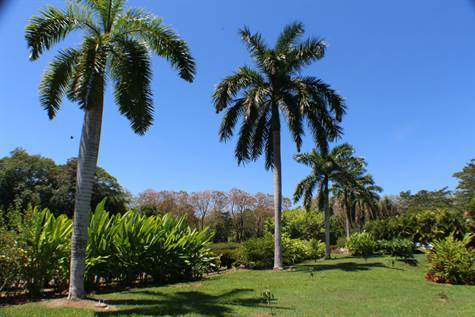 This impressive property is situated on a huge lot of 1.3 acres (4852 meters) and overlooks the ocean valley and lake area of this pictureseque Esterillos Valley area. The award winning beautiful beach and beach club for this community are located one mile away. This multilevel home has over 3000 square feet of living space (290 meters) and has recently been remodeled, repainted, landscaped, and a brand new infinity pool put in. Enjoy stunning vistas from ever window in the house, and sit on the highest crest in the area, overlooking the majesty of the world famous flora and fauna that Costa Rica is renowned for. 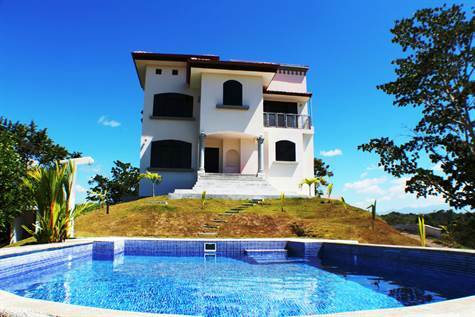 This very low key community has ten completed homes on spacious lots and is a community of Costa Ricans and North Americans, These homes are located in a picturesque country setting in the gently sloping hills of the Esterillos area. This home was built to luxury specifications using the highest standards of construction and is a large North American Style home. The rooms are large, with closets, new ceilings fans and AC units. There are en suite bathrooms and a beautiful spacious kitchen, dining, den, and living room areas. There is also a huge car port as well. Property is unfurnished; there are optional furniture and appliance packages available from the builder to fit your style and budget. The property manager (if needed) lives in this community. The property is located about one mile to area beaches. There is a beach club at the Monterey Hotel, with free membership to owners of this home. Beach club has a large pool, restaurant and bar, and other conveniences for your day at the beach. Please call or email me if you’d like to discuss further details regarding this property. Jacó, Garabito - This beautiful 3 bedroom/2.5 bath beachfront boutique condominium development, with its own section of boardwalk and luxury ambiance, is only a five minute walk to downtown Jaco, and is an oasis of tranquility, luxury, ocean views and jungle vistas. This unit is located on the third floor, with ocean and jungle views, a spacious balcony, and finished and furnished in a tropical, “Mediterranean Hacienda” style. Large kitchen features stainless steel appliances, granite counter-tops, and solid wood cabinetry, the doors and door frames are made out of beautiful Costa Rica Molina, a tropical hardwood impervious to insects and tropical climate. This unit has never been rented out but this development is in a premium location if you would like to invest in this property for rental income potential. There is property management in place, and with only 16 units total, this development is a highly desirable, unique, low density, oceanfront community. Enjoy privacy and security, with AC; cable TV, Wi-Fi, washer/dryer. Oceanfront swimming pool, Jacuzzi, 24 hr security, 5 minute walk to restaurants and shopping. Price has been adjusted for our Buyer’s market; ask me about financing and more information etc. Playa Hermosa, Garabito - This land parcel property has STUNNING views of not only the ocean at Hermosa Beach AND Jaco Beach, but also the magnificent jungle covered mountains, beautiful trees, and flora and fauna that make Costa Rica an international phenomenon. This could be the future dream site of an incredible estate home or development. This property must be on your wish list if one of your “Must Have” conditions is stunning views. The property is located only ten minutes from the Coastal Highway that winds between Jaco Beach and Hermosa Beach. The road is not paved but is graded and smooth at the time of this writing. It is approximately a ten minute beautiful and scenic drive from the highway up to the site. The road has always been one of the roads the municipality has maintained due to its popularity with local and tourists for biking, hiking, driving etc. This property is a large parcel at 14, 157 meters (3.5 acres) and would most efficiently used as a large estate site, or subdivided into separate lots for resale or for development. Property has its own well and electricity to the site. Call or write today to discuss further details. Jacó, Garabito - This beautiful two bedroom, two bath condominium is located on the top floor of a boutique beachfront development and features fantastic “up close and personal” ocean views, as well as views of the growing beachfront “skyline” of Jaco. Also, this price is in line or better than any other three bedroom top floor unit on the beach. This unit features two large bedrooms, with an en suite master bathroom in the master bedroom, the guest bedrooms is very spacious and there is plenty of closet space in each unit. The huge main balcony is a fantastic feature for watching the ever changing moods of the ocean, the rolling waves and brilliant tropical sky. 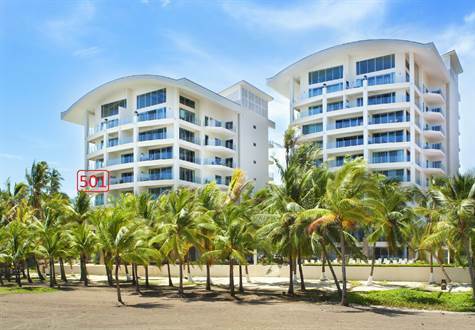 This beachfront development is considered a luxury boutique condominium complex, with beautiful finishings and incredibly sturdy construction of steel reinforced concrete block. The salt water pool (no chlorine or abrasive chemicals used), deck, patio, and stairwell areas are finished in gorgeous coralline tile, imported from quarries in the Dominican Republic. The appliances in this unit are all high end GE product, in new condition, as well as the custom designed furniture and big, beautiful, custom made granite countertops. This is a quiet, high end development with great clientele, 24 hour security, and property management. Unit has not been rented out, but other units in this building are showing strong, steady ROI and this unit has excellent potential for rental income if desired. Call or write today for more information. Playa Hermosa, Garabito - If you love the beach and have dreamed of owning a beachfront fully titled home on one of the most consistent surf beaches on the planet, you’ve found the right property at the right time at the right price. This spacious home features a large open floor plan of 2800 square feet of living space. There are three spacious bedrooms and two bathrooms, large kitchen with dining area. The living room opens up to a beautiful private pool and a huge front yard and the beach. Also, there is another yard section behind the house that could be utilized for an additional structure (2 story guest house with ocean views perhaps). You cannot get closer to the beach here without being literally ON THE SAND. You will spend many of the cool mornings and evenings watching the sunset as surfers glide over the big waves of Hermosa and enjoying the incredible wildlife and world famous flora and fauna that Costa Rica has in abundance. Wildlife regularly spotted includes scarlet macaws, capuchin (white face) monkeys, iguanas, toucans, herons, egrets, green parrots and the occasional whale and dolphin. Home is fully air conditioned, kitchen is spacious with granite countertops, all appliances and furniture is included in this incredible turnkey opportunity to own the beach and a lifetime of spectacular views! Playa Jaco, Jacó - Welcome to luxury in the heart of Jaco beach. This three bedroom, three bath luxury beachfront condominium offers a spacious floor plan at 2260 square feet, luxury finishes and furnishings as well as INCREDIBLE views from it's fifth floor location facing beautiful north beach Jaco. This development consists of two beachfront buildings and beautiful common areas with large pools and water features. 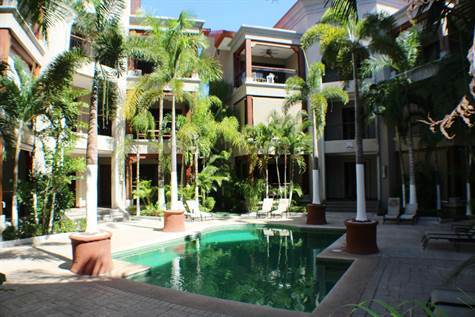 This unit has excellent rental income potential due to it's premium location in the center of Jaco, as well as 24 hour staffed security, housekeeping and onsite management. 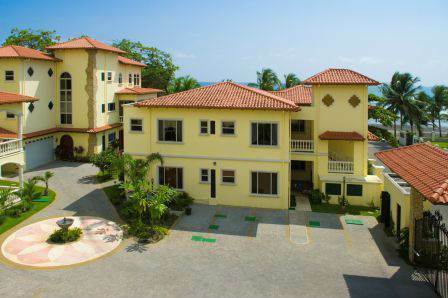 Jacó, Garabito - Another fantastic Buyer's Market deal in Jaco's beautiful (and growning) North Beach. This condominium is an excellent value priced to sell quickly by a motivated seller who is ready to deal! With three spacious bedrooms, this unit has enough room for you and your guests/family as well as offering excellent views of the beach, ocean and pool areas. Condo is sold fully furnished/turnkey and has excellent rental potential due to it's premium location. Please write or call for a full list of inventory on the beachfront in Jaco and to discuss your options based on budget and need. Jacó, Garabito - This fifth floor unit has such incredible ocean views that you'll spend the majority of the time on your balcony gazing out onto the endless expanse of the Pacific. The beach below (north beach) is one of the best sections in Jaco, with soft sand, and a gentle slope down to the waves below. There are also groves of shady palm trees and you are right next to the brand new 50 million dollar Vegas style Casino Resort called "Croc's (Grand Opening is February 2015). This condo is only two years old, is tastefully furnished with high end furniture and appliances, and owner is highly motivated to hear offers. Due to it's premium location this building has an excellent rental draw as well as potential for quick appreciation. There is condo management company available as well as management services for you and your guests. Bejuco, Garabito - This beauty is one of my favorite beach homes in this community due to its custom design (large open floor plan), furnishings, finishes and amazing yard and location within the community. Tastefully appointed and kept in immaculate shape by its North American owners, this beach house has comfort, beauty, excellent sturdy construction and is located on a great lot with green zones on three sides. This 2700 square foot home has four bedrooms and three full bathrooms, two of the rooms have their own “en suite” bathrooms which you and your guests will love, as well as additional square footage in the spacious Master Bedroom. Plenty of light and scenery are visible through the large bay windows. There are closets (including a walk in closet in the master bedroom), and a queen sized bed in the guest bedroom that can be divided into two separate beds if needed, all furniture is custom built Costa Rica hardwoods that look simply amazing and are weather and humidity resistant. All furniture and appliances are included in the sale. Only a few personal items and paintings are excluded. The spacious kitchen has plenty of cupboard space and large granite counter tops, stainless steel “Frigidaire Appliances” are in new condition, and there is a breakfast bar seating area as well. In your backyard “Shangri La”, you’ll love watching the birds flitting amongst the amazing Costa Rica flora and fauna, and your large private pool with waterfall feature. All patio furniture is high end and there is also a “Rancho Style” roofed shaded area as well as the back patio. You’ll spend a lot of time outside, as there is also a front porch area as well! Additionally, there is a convenient outdoor shower area, gas BBQ unit, and privacy fences and hedges of hibiscus and bougainvillea. This is an extremely popular and successful development with 24 hour security, lovely common areas including pools, tennis court and party/meeting areas. 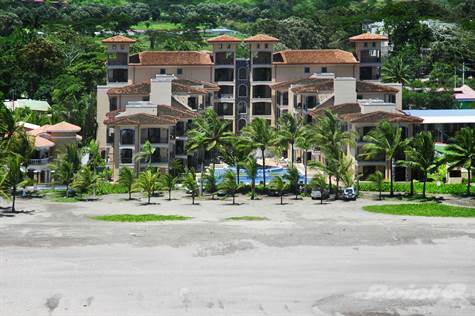 Best of all this community is a mere 200 yards to the sand at beautiful Bejuco beach. This specific lot location is one of the closest to the beach (you can hear the waves) and furthermore has a green zone next to it that will never be built on. As you are also on the perimeter of the development you have nature backing you up on three sides, adding to the sense of privacy and tranquility. Please call or write today to schedule a showing of Casa Mariposa! Playa Hermosa, Garabito - Great opportunity to own a beautiful custom built home in a beachfront gated community at a Buyer’s Market Price! This 2400 square foot home features three bedrooms (master with en suite bathroom), and three bathrooms with fantastic deck areas including a rooftop deck with great ocean and mountain views, perfect for stargazing, happy hour, sunrise and sunbathing! Walk about 100 yards to the huge pool area which opens onto the cinnamon colored sands at Playa Hermosa. This is the best section of Hermosa Beach with numerous shady palm tree areas and a large gentle expanse of soft sand. If you surf, this is the one of the most consistent breaks in Central America and home to numerous surf competitions, including hosting the Billabong World Championship in 2009. Property is a great value given the growth in the area and lack of premium 100% titled beachfront areas that are suitable for development. This community is 100% titled, infrastructure is completed, there is 24 hour security and the common areas are beautiful. This home has never been rented out, but could be utilized for rental income as the potential is excellent. Current owners in this community are making income by renting out their homes. Everyone wants to be on the beach! The bustling beach town of Jaco is only a few miles away, with almost all of your major amenities, and dozens of bars and restaurants, there is a huge brand new casino resort in the area as well as a marina and 18hole championship golf course just minutes away. Also, Playa Hermosa and Jaco are only a 1.5 hour drive from capital city of San Jose and the International Airport. Please call or write for more information including floor plan, plat map etc. 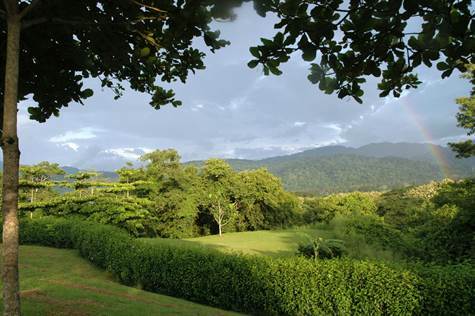 Carara, Puntarenas - This lot is located approximately 20 minutes North of Jaco and is in an extremely beautiful and diverse ecosystem and micro climate in the transition zone of tropical rain forest to tropical dry forest. This property is an excellent opportunity if you are looking for land with infrastructure to the site, easy access road, gorgeous rolling scenery of jungle covered hills and jaw dropping flora and fauna, as well as being right in the middle of one of the most active Scarlet Macaw flight paths in Central America. Other attributes listed here. 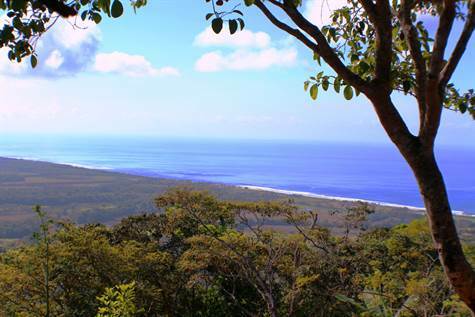 Views of protected Guacalillo Reserve; home to the last wild Scarlet Macaws on Central Pacific Coast. Conveniently close to area beaches, and San Jose, yet very tranquil. Electricity and water on corner of Lot. Very few build-able Lots remain in this established neighborhood. Here you will enjoy the best of Costa Rica in your own private Shangri-La!